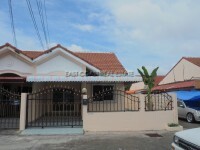 Ngamcharoen 2 - Town House for 2 storey house for sale set on 18sq.wah. Consists 2 bedrooms 2 bathrooms with partial furniture, 2 Air conditioning, Built-in kitchen and end of house with water tank. The village is conveniently located close to local markets, shops and restaurants. It easy to get to Central Pattaya or out to Bangkok. ** Deeded in Thai name Transfer fee 50/50 transfer tax between buyer and seller.